Throughout our six-year partnership with Heifer International, Lifeblue has sought to deliver solutions that make it possible to achieve the nonprofit’s mission: to end hunger and poverty while caring for the Earth. And for one week each year, we push those efforts into overdrive. Oct. 1 marked the start of our fifth annual Heifer Hack Week, when our entire company travels to Heifer headquarters in Little Rock for an all-hands-on-deck, full-speed, dream-big effort to make the largest possible impact on our partner’s business. 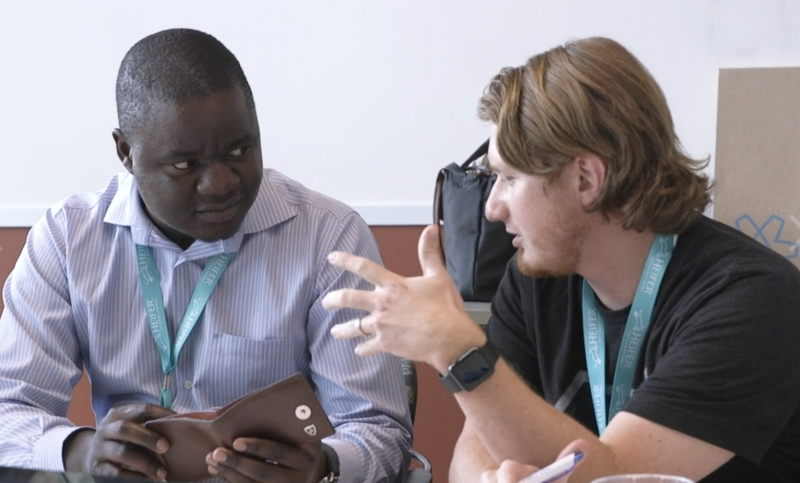 In all, more than 50 people from Lifeblue and Heifer – including many of the nonprofit’s country directors who traveled to the U.S. to take part – spent a week in close quarters, dreaming and designing new ways to broaden Heifer’s impact. By the end of our time together, five key projects had taken shape – from the white board to the website, from the boardroom to the village – that serve to help Heifer empower women worldwide, teach sustainable farming and improve economic systems to benefit small-scale farmers. The outcomes ranged from simple platform changes, user experiences and web templates to ambitious blueprints for helping Heifer care for the Earth in villages around the world. For Lifeblue’s team of technologists, the annual visit is a chance to focus sharply on their own mission: to enable companies to make a social, cultural or economic impact on the world. Brainstorming at Heifer Hack Week. The fifth Heifer Hack Week served as another milestone in what has become a seminal relationship, one that serves as an example of what can be achieved when partners work together for a common solution that focuses on outcomes and not solely on process. Learn more about Heifer International here.